This offers a new and simple, yet highly effective way to restore radiant and hydration around the eye area. 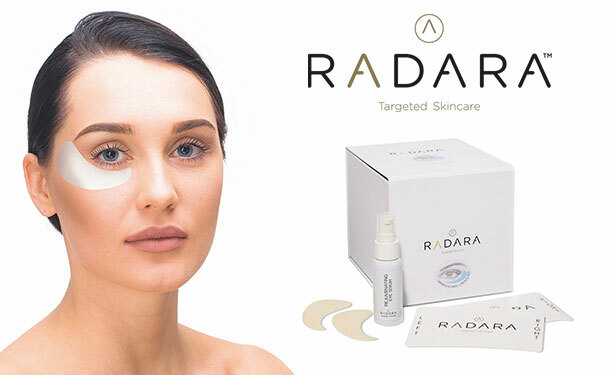 Radara uses unique micro channelling technology in the form of a patch to deliver a pure, highly concentrated hyaluronic acid (HA) serum deep beneath the skins surface for long-lasting results. When the HA serum is applied through the patches, it travels deep below the surface of the skin. HA is natures plumping and hydration module restoring elasticity and hydration for a smoother and firmer appearance. Independent clinical tests show Radara significantly reduces fine lines and wrinkles for an average of 35% in just 4 weeks. The treatment is painless with no redness, swelling or down time. It is gentle enough to use every day for 28 days, the treatment cycle can be repeated 3 to 4 times per year. It only takes 5 minutes per evening to apply. Noticeable improvement in skin in just 2 weeks. Best results seen in 4 weeks.